There are 22 Assisted Living Facilities in the Jensen Beach area, with 3 in Jensen Beach and 19 nearby. The average cost of assisted living in Jensen Beach is $3,258 per month. This is lower than the national median of $3,346. Cheaper nearby regions include Port Saint Lucie with an average starting cost of $2,569. To help you with your search, browse the 188 reviews below for assisted living facilities in Jensen Beach. On average, consumers rate assisted living in Jensen Beach 4.0 out of 5 stars. Better rated regions include Port Saint Lucie with an average rating of 4.1 out of 5 stars. Caring.com has helped 11 families in Jensen Beach find high-quality senior care. To speak with one of our Family Advisors about assisted living options and costs in Jensen Beach, call (855) 863-8283. Promotion ends in 2 days! Jensen Beach is a small community located in Florida’s Treasure Coast. Nearly 12,000 people reside in Jensen Beach, and almost 30 percent of them are seniors. This community is home to three assisted living facilities. The surrounding area, which includes Port Saint Lucie and Stuart, offers another 19 facilities. Assisted living facilities in Jensen Beach are regulated by the Florida Agency for Health Care Administration (AHCA). These facilities provide assistance with personal care, nutrition and medication management, and they are home to one or more residents. Jensen Beach has an average of 239 sunny days per year, so seniors can enjoy their favorite outdoor activities. Winter lows are in the 50s, while summer highs creep into the 90s. The cost of living in Jensen Beach is higher than the national average, though lower than the Florida average. Seniors who are interested in relocating to Florida may choose Jensen Beach for this reason. Jensen Beach is serviced by Martin County’s Public Transit Service. Three fixed-route bus routes are available, so seniors can travel to medical facilities and shopping centers. Special programs for accessible transportation are available to ADA-eligible seniors. Jensen Beach offers plenty of activities for seniors. The community is home to many specialty stores and fine dining restaurants, and some assisted living facilities may take residents on supervised outings to these destinations. Jensen Beach has few facilities from which to choose in the event of a medical emergency or illness, with the nearest major hospital located in Stuart, Florida. Jensen Beach has an array of community resources for seniors, including the Log Cabin Senior Center. This center provides recreational programming, such as low-cost art and yoga classes, for area seniors. Assisted Living costs in Jensen Beach start around $3,258 per month on average, while the nationwide average cost of assisted living is $4,000 per month, according to the latest figures from Genworth’s Cost of Care Survey. It’s important to note that assisted living rates in Jensen Beach and the surrounding suburbs can vary widely based on factors such as location, the level of care needed, apartment size and the types of amenities offered at each community. 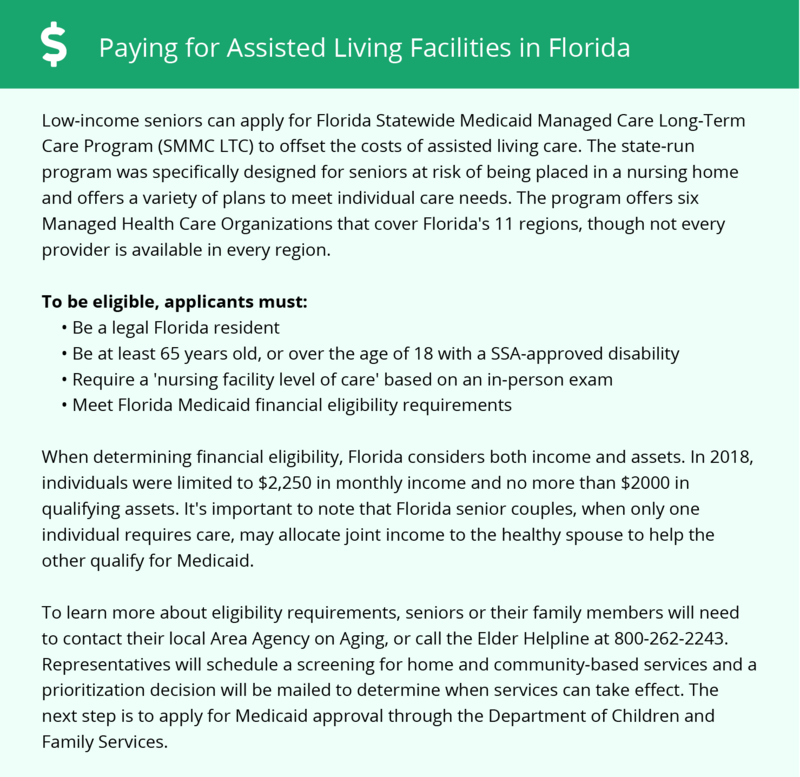 As in the rest of Florida, Jensen Beach seniors may be eligible for financial assistance through the state’s Optional State Supplementation (OSS) program. This cash assistance program helps eligible seniors pay for room and board at licensed assisted living facilities. This program is designed to supplement a senior’s other income and can be received alongside Supplemental Security Income (SSI) benefits. Learn more about these programs, plus who’s eligible, on our Assisted Living in Florida page. For more information about different ways to finance assisted living, visit our Assisted Living in Florida page. Jensen Beach and the surrounding area are home to numerous government agencies and non-profit organizations offering help for seniors searching for or currently residing in an assisted living community. These organizations can also provide assistance in a number of other eldercare services such as geriatric care management, elder law advice, estate planning, finding home care and health and wellness programs. To see a list of free assisted living resources in Jensen Beach, please visit our Assisted Living in Florida page. Jensen Beach-area assisted living communities must adhere to the comprehensive set of state laws and regulations that all assisted living communities in Florida are required to follow. Visit our Assisted Living in Florida page for more information about these laws.